Rev. Adrian De Visser currently serves as the International Deputy Director for South Asia and is also the Founder and Senior Pastor of Kithu Sevana Ministries based in Sri Lanka. Adrian entered Christian Ministry in 1979 as the first local-language ministry worker for Youth For Christ, Sri Lanka. His work took him to remote and marginalised communities and gave him a deep conviction and passion for reaching them for Christ. 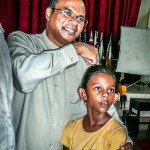 In 1993, he founded Kithu Sevana Ministries, a missions-oriented church planting organisation with a burden for reaching those in areas and communities hitherto unreached by the gospel. Kithu Sevana follows the concept of a distributed church, and strongly believes in partnering with Churches and Christian ministries across Asia and in developing and empowering local leaders for ministry.